Rosemary Low has kept parrots for more than 50 years, concentrating on lories and South American parrots. She is the former curator of birds of Loro Parque, Tenerife, and Palmitos Park, Gran Canaria. With more than 20 books published on parrots, these books have been translated into German, French, Spanish, Portuguese, Italian, Czech, Hungarian and Dutch. 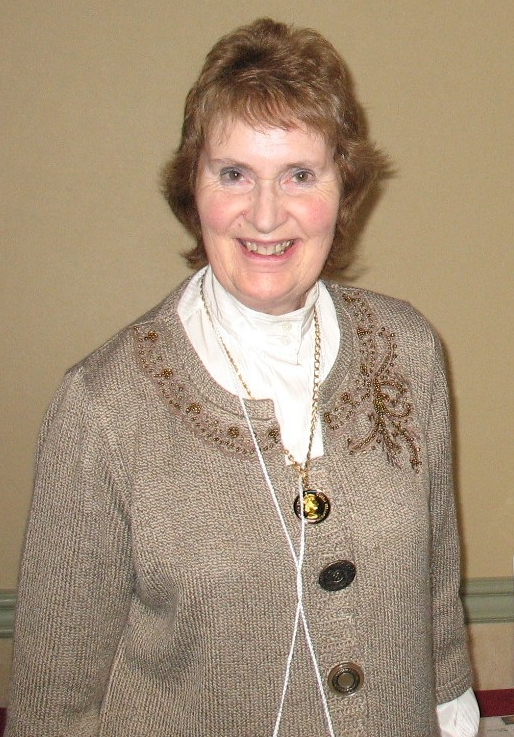 She has been writing for specialist magazines worldwide, especially in the UK, Australia and Europe, since the 1970s, and has had literally hundreds of articles published. Main topics are conservation and birds, especially parrots. 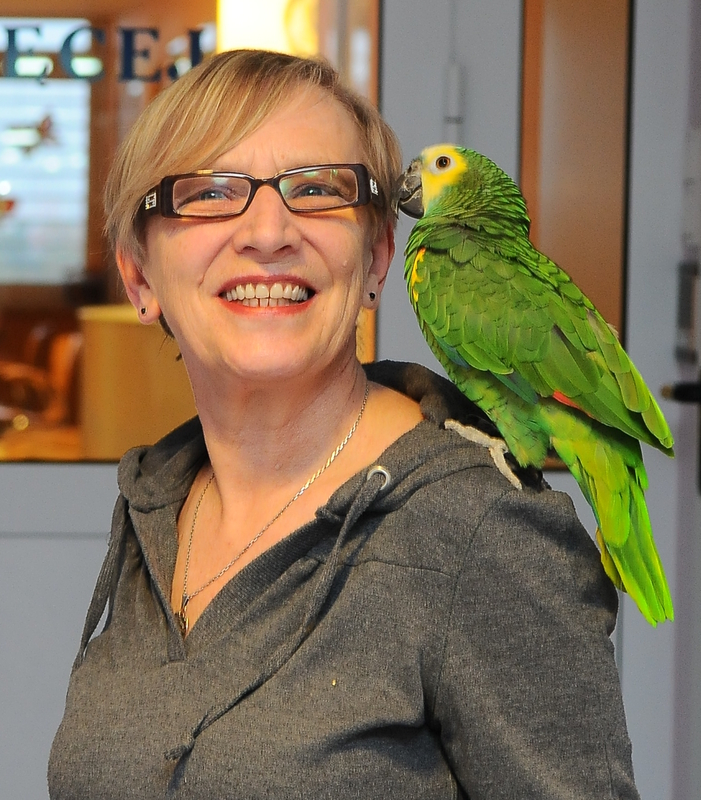 Rosemary has visited 27 countries to observe parrots in the wild, especially in South America. In recent years she have been involved with, raised funds for and written widely about bird conservation projects, and has spoken at many symposiums on the subject. She have been employed solely with free-lance writing since 1995. Graduate of the Warsaw Ballet Academy, scholar of the Broadway School of Dance and the Revue of Paris, outstanding dancer, choreographer and show director, originator of the Sabat - the first Polish group of modern dance; author of revue, stage and TV performances. Winner of many prizes, honored with the Golden Cross of Credit for propagating Polish culture in the world. Her pupils dance in the most famous cabarets of Paris, among others in the "Moulin Rouge" and "Lido". In 2002 she founded the Sabat Theatre, the first and 'the one and only' revue theatre in Poland. It was created from her passion and love for dance. Many splendid world-level-performances were created here. The owner of the Galah cockatoo. The fourth after-war organ-grinder - a personage always associated with Warsaw. For tens of years he has been appearing with his barrel organ in the Warsaw Old Town dressed in a characteristic epoch clothing, with a parrot on his shoulder. He is a reminiscence from the childhood of many of us. Participated in many stage and theatre performances, TV programs, classical music church concerts, the concert for the Polish pope in Vatican, and in the World EXPO 2005 exhibition in Japan as a flagship of Poland. Conceiver and co-organizer of the International Festival of Organ-grinders in Poland. Participated in festivals of organ-grinders and street artists in many countries of Europe. 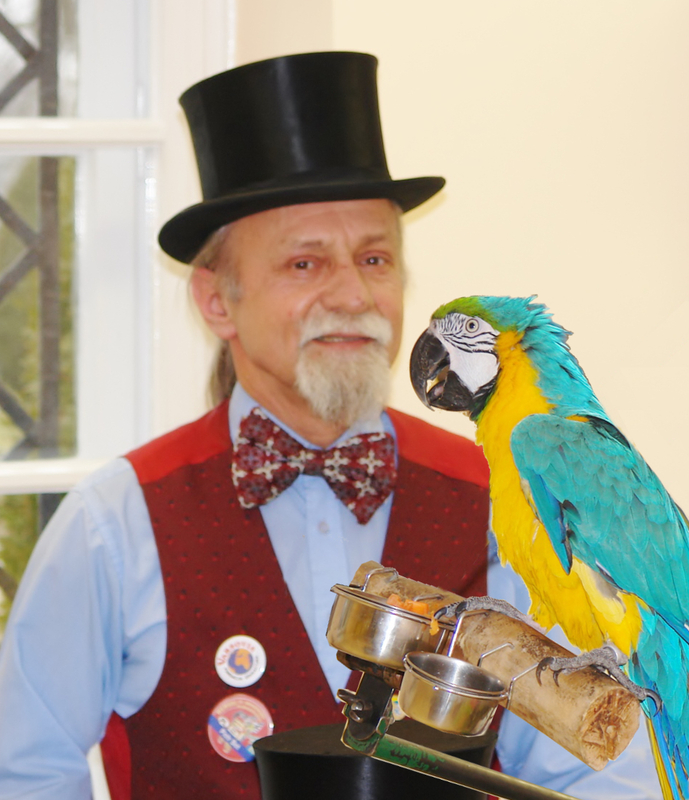 During his performances he is accompanied by his parrots - Blue-and-Gold Macaw named Carlos and Eastern Rosella named Kubuś. 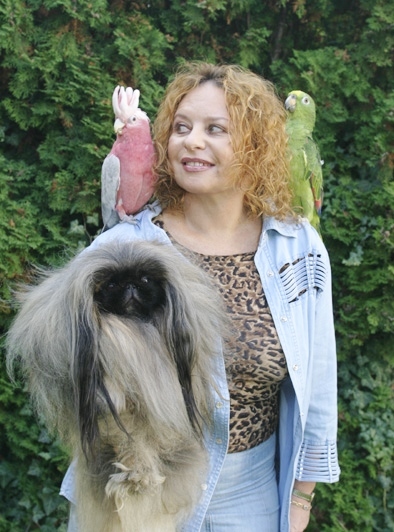 Owner of famous Indian Ring-necked parakeet named Carol - the Vice-Master of Poland of the 2nd Talking Birds Championship "PARROT CHAT" 1999. Carol has become famous by declaiming Polish romantic poetry. 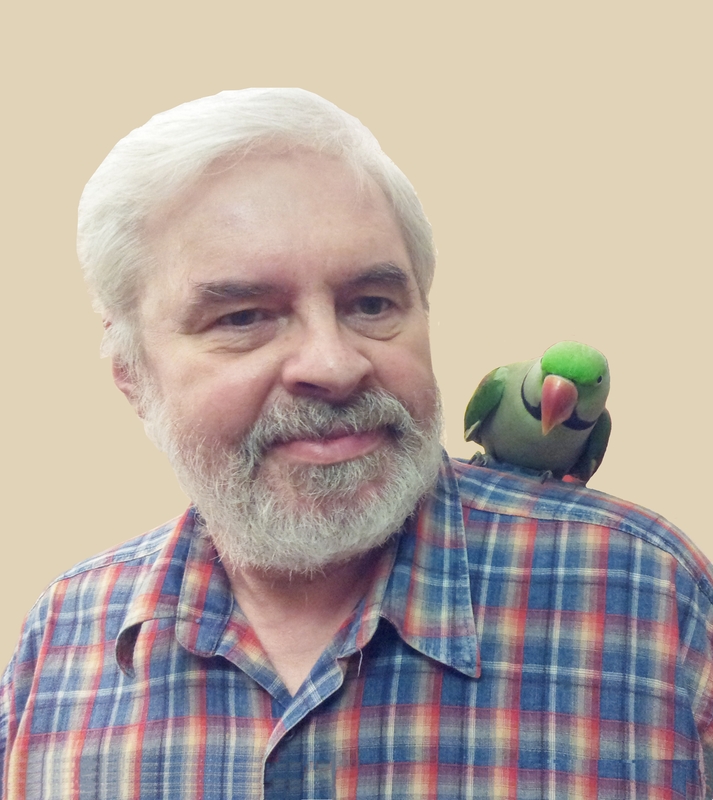 Now, Mr. Zaręba is an owner of the Alexandrine parakeet named Arni (a contraction of Arnold), but his interest in birds developed also in the sphere of representatives of our indigenous fauna. That is why he can be met with field glasses when he is watching them in their natural inhabitat. Moreover, he constructs nest boxes and attaches them on trees, and in winter time he fattens birds on birdtables which he also makes by himself.